The Seattle Police Department’s latest use-of-force data, which include officer-involved shootings, show a continuing decline since 2011, when the Department of Justice found that Seattle officers too quickly resorted to force. As part of an effort toward transparency, the Seattle Police Department (SPD) has released a report on two years of use-of-force data, which includes officer-involved shootings. One key finding is that in a 25-month period between 2014 and 2016, use of force was a rare occurrence. In the nearly half a million unique events during this period, officers reported using force in 4,216 dispatches — less than one-half of one percent. This demonstrates a 55-percent reduction in use of intermediate-level force since 2011, when the Department of Justice found that Seattle officers too quickly resorted to force. There are three levels of use of force. The lowest level (Type I) can involve actions that cause transient pain, like, for example, “soft takedowns” used to control a person who is resisting arrest. Nearly 75 percent of SPD uses of force were at this lowest level. Type II use of force may cause physical injury but not substantial bodily harm. Examples would include a “hard takedown” or use of pepper spray. Type III is force that could be expected to cause great bodily harm, loss of consciousness or death. In the period covered in the report, there were 84 Type III uses of force, including 14 officer-involved shootings. Approximately one-third of subjects of use of force are black, although blacks make up just 7 percent of the city’s population. This disparity is consistent across the different levels of use of force. Whites are subject to the use of force slightly more frequently than blacks, even though whites represent two-thirds of the population in Seattle. Asians and Latinos are also less-frequent subjects of use of force compared with their share of Seattle’s population. She points out that the Seattle region has high mobility, and people who are arrested here don’t necessarily live here. In the city’s South End, there is a large concentration of gang activity, and data show that many people involved do not live in the area where the crime is committed. 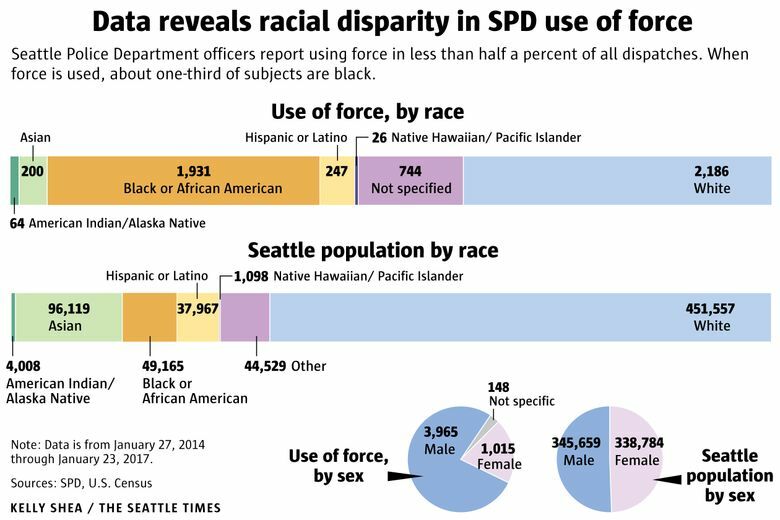 But the SPD is working with the Department of Justice and national experts on race and social justice to explore methods for using data to get at some of those underlying reasons for the disparity — and, more importantly, how to address them. There’s another disparity in use-of-force data: Men are the subjects of uses of force about 80 percent of the time. The highest rate of uses of force is in the Capitol Hill/Central District area. Significant nightlife activity here is often associated with fights and opportunistic robberies. For similar reasons, the Pioneer Square area also has a high rate of uses of force. Rainier Beach, in the southeast corner of Seattle, is another part of the city with a more frequent rate of uses of force. The area has a high concentration of reports of shots fired and violent-crime calls.